1. BB-10 persists off the AP coast. Rain effect seen in SW and South segment. Expected to cross North AP coast on Sunday as expected. 2. Machillipatnam received heavy rains on Saturday (5 cms).Chennai measured 14 mms till 8.30 pm Saturday. Modak Sagar 97.7%, Tansa 99.5%,Vihar 97.6%, Tulsi 98.8%, Upper Vaitarna 93.2%, Bhatsa 87.1% and Middle Vaitarna 99.5%. Total Storage 13.35 Mcum...that is 348 days..upto 10th Auguat 2017. Much is being talked about the South West Monsoon "failing' or letting us down with the current break Monsoon conditions. I do not apprehend much to this. This breaking conditions were expected, while the rains continued in M.P. and parts of UP and Himachal. Even though the current deficit of the Monsoon in India has become -3%, we have almost another 1 month of good rains to recover the deficit, and there is no need to change the original estimate of +4%. Though the normal rains in September are low, if we get heavy showers, amounting to good figures, the deficit can and may be wiped out. We see an early BB-10 taking shape and reviving the Monsoon in Northern Peninsula regions soon. A surprise (and welcome) Low pressure , BB-10, has formed earlier than expected off the North A.P. coast. As the Low pressure tilts upwards towards the upper air (South East wards), a off shore trough from the system runs Southwards along the East Coast. BB-10 is likely to track North initially and cross the A.P./Odisha coast by Sunday. As a result, rainfall will occur in heavy falls along the North TN, AP coast, with fairly good rains in Odisha on Saturday. Indications of BB-10 late tracking W/NW are strong. An UAC forming over South Rajasthan and adjoining Gujarat region strengthens the core of the seasonal Low in Southern Pakistan/adjoining Rajasthan region, which in turn will increase rainfall along the West coast of India, Southern Rajasthan and North Gujarat, Saurashtra ( got good rains on Friday) and Southern Sindh in Pakistan. 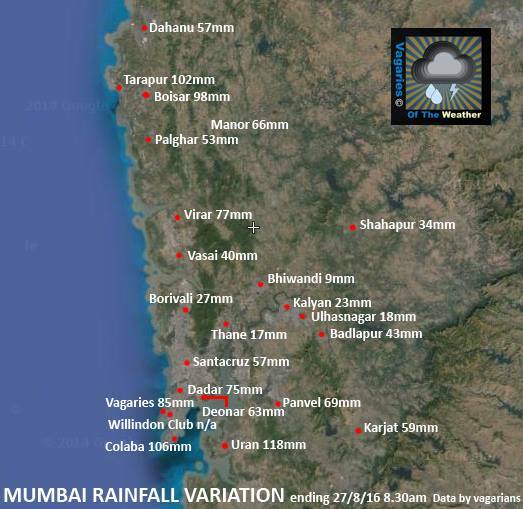 Mumbai: Frequent showers on Saturday and Sunday, some heavy.Chance of thunder also possible. Basically weekend will be frequented with regular showers, an increase in frequency over last week's performance. Ahmadabad: Fairly good rainfall on Saturday and more frequent with heavy showers on Sunday. Saturday and Sunday may see accumulated 45-50 mms. Surat: With the off shore trough strengthening, the Northern point of the trough will see good showers. Surat will get thunder showers on Saturday and Sunday, with cumulative 2 days amounting to around 30-40 mms. Karachi: Chances of thunder showers on Saturday and Sunday. But, not very heavy, as only heavy showers in some parts are likely to be occurring. Chennai: Thunder showers, some heavy, will occur this weekend, with around 30 mms of rain accumulating on Saturday and Sunday. We have been getting good rains since yesterday in mumbai.friday rains were mild but seems we have got good rains in the night..:)..
Raining with heavy pours over Navi Mumbai entire night...looks like 24hrs of rain 100-200mm. 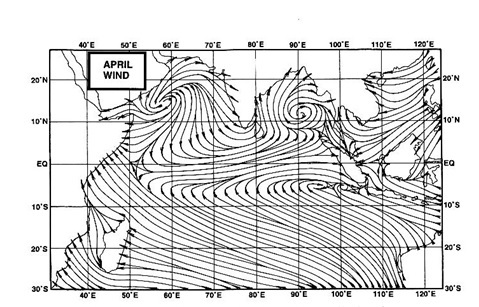 My guess is since june whenever west coast trough was present at same time UAC formed over RAJ/GUJ. This may be causing trough to be extremely strong tough over MAHA -leading to more than annual dump in just 2 months (rains with 200-400mm in 24 hrs) but very weak trough over KER/KAR west coast (just 20-30mm in 24 hrs) of rain- with this how can Cauvery ever fill up? RAJ is extremely luck in fact over past 5 years was always on excess rains. MAHA/Central India is lucky to get rains from AS/BAY but during SWM much of southern India only depends on west coast trough. Till we have regular bay lows and UAC over RAJ monsoon axis can never come down to south India. THank u So Much Sir :) So the Withdraw from Sindh after this spell, right? Was there a need to revise and downgrade to Normal From Excess (+4%)? I dont understand which factor played such a heavy role in doing this because even where its excess forecasted was just +4% , and their normal means as per my reading is Not Less than 90% and Not More than 104% of its LPA- Was deficiency caused after 1.8.2016 till 24.08.2016 was such alarming ( only 3% of total seasonal till 24.08.2016)? We all know break monsoon period always being present in SWM. Mumbai,Harnai 3 digit rains - Harnai back in action. Very soon both Colaba/Santacruz will cross 2000mm mark. RAJ becomes sweet spot for UACs. Dear SSet. Mumbai(Santacruz) has already crossed 2000 mm, and it is currently at 2087 mm! Telangana (Hyderabad), NI karanataka region experiencing break monsoon conditions more than one month. I was hoping BB10 will bring good rains. But it seems this BB too heading towards sweet spot west MP. Or is there any hope of good rains in this region still on cards. Rajesh sir,I am very frank in expressing my thoughts....I do not like long explanations...rather I present my points precisely.This time you disappointed me for the first time...You mentioned in your forecast two days before that Mumbai would be dry with some passing showers till the end of august.But it rained heavily around 106mm in scz.You failed to predict this time though you mentioned this yesterday night about mumbai,s rain .I always like your forecasts ....and immensely believe in your forecasts....and always try to get something from you....so it is always said that there's a scope for improvement.Sorry to point you out...but this are my views...Hope you will work on it. karnataka empty dams...drought anticipated. Now coastal KAR along with KER enters into scanty (RED zone as per IMD)... Would anyone would have anticipated western ghats to be in scanty zone? here in madhyapradesh many places have crossed mark of 1500 mm and capital also stand with 1330 mm that is so much of rain because it is not near to sea aur any significant ghat section but back to back low and uac are coming to m.p. makes it to most excess rainfall state in india hardly two districts are fall back to deficit rain. it is a god grace and hope that peninsular india also come into action because most of the area of kerala is in deficit and also int karnataka and a.p. yes i had mentioned earlier that we are used to depend on Rajesh sirs forecast. many times I plan according to his forecast. but that is what known as 'Vagaries of Weather'. so we should not be disappointed. Rajesh sir, please continue to give us your views which are far more accurate than any other weatherman. What is a forecast? Its a calculation or estimate of future events, especially coming weather or a financial trend. I don't think it's anything pertaining to rocket science. Vagaries of weather blog name says it's all better than anything else. Ap and Telangana are getting good rains so they are catching up.kerala anyways gets rains also in NEM only Karnataka is a concern. abizer: 1... The forecast for Mumbai was not given 2 days ago but on 22nd Aug. 2... It was not till end of Aug but 30th Aug. 3..I mentioned in the last article that the Low BB-10 came earlier than expected. 4...You mentioned that you were disappointed with my forecast for the first time. Happens sometimes when things change beyond control.5...and it rained 106 mms at Colaba and 57 mms at Scruz. Things have changed after 5 days of correct expectations..
remember, things can change in 12 hrs also. And I don't think it was drastically off the mark here. Heavy in some areas as we expected. Yes sir,I agree that its very difficult to predict nature...We can see this in the case of july 2005....where 944mm rain was recorded in scz,and imd failed to predict it,leading to damage of life and property. By pointing you out I am not criticizing you,I always praise people especially like you who never predict wrong. BUT I WANT "VAGARIES OF WEATHER" to reach the topmost level of perfection and be the best weather forecasting blog.I WISH YOU RAJESH SIR,FOR YOUR AHEAD JOURNEY IN VAGARIES FOR PREDICTING WEATHER. Some people get much appreciation from others,and stop progressing,I do not expect this from VAGARIES.It was just my statement to encourage you rather than bogging you down.Take it positively.Thanks. Heavy rains overnight and since morning till now continuing and pouring heavily at borivali and Western suburbs.what I observe is clouds height are low. Seems like one is at hill station as we can see clouds lower than some high rise buildings here. Mumbai has been receiving heavy showers since morning what are the forecast for tomorrow ? I don't see any problem here Vageries had already predicted "heavy rains for Mumbai - saturday/sunday -now 48 hours have passed heavy rains at times very heavy still pounding navi mumbai"
After a good july, August has been hot and dry for Kathmandu, Nepal. Normal august average rainfall is 330 mm and till today only 110 mm has fallen, just 1/3 of the normal. and yesterday max temp was 32.4 C, all time high record for august being 33.6 C. Any chance of things changing any time soon ? But BB-10 will only favour Central India, MAHA, GUJ, RAJ, North AP(if lucky) down entire south still remains dry - west trough yesterday gave only 20mm for Augumbe - Only NEM (if it happens) can save delta areas of Cauvery towards TN. RAJ Jaiselmer,Kota - 100mm. Guess we are now looking change in climate - new arid areas are appearing over south while erstwhile arid areas (RAJ,GUJ,MP) are becoming wetter. Kachwala - your statement are not in good terms -> vageries has taught us/general public with many new things on weather we should respect but not blame - RAJ sir is forecasting with near accuracy - actual precise accuracy only GOD can do! Rajesh sir pls continue and improve your good work. Yes there has been a change in trend in monsoon over past few years. Western ghats and south peninsula seems becoming dry whereas central India particularly MP and Raj are becoming wetter. I hope he situation turns around for good for western India and south peninsula. Still more than a month for the monsoon to catch up. It is also to note that last year chennai received unprecedented rains due to NEM. So the peninsula areas have a second chance thru NEM. But western India Mah, Guj has only this monsoon to fill their reservoirs and water levels. I guess this is same for NI Kar and Telangana as well. The situation does not look great for DELHI-Haryana area even in early September.Sir any possible spell that could bring deficiency down in Sept? Rajesh Sir i have 2 query . 1.Is Typhoon Lionrock(Western Pacific) disturbing current monsoon systems ? 2.What is early signs of SW Monsoon Withdrawal ? Salim Ramani: No, this Typhoon Lionrock has not directly disturbed Monsoon. As per IMD criteria South West Monsoon initial withdhrawal norms are:i)Cessation of rainfall activity over the area for continuous 5 days. satellite water vapour imageries and tephigrams. Anoop: Delhi NCR received some showers on Monday. I have put up my views for next 2 days. But, there are some rains possible in Delhi region ahead. Neeraj: Good to hear from you. As per axis movement indications, rains possible in East Nepal regins soon this week.